Doctors treat a number of eye conditions with lasers, and many patients do not experience complications or side effects from the treatments. In some cases, however, a patient may notice floaters after a laser eye treatment. Floaters will appear as black spots in the vision, often floating in and out of vision. Knowing some of the causes of floaters after laser treatments may help a patient understand the condition. The natural lens inside the eye turns cloudy with age, and when the cloudiness disrupts vision, an eye surgeon may recommend surgical removal of the cloudy lens, called a cataract. The doctor will remove the cloudy lens and insert a lens implant. The new lens attaches to the thin, clear capsule that housed the natural lens. Over time, a number of patients experience blurry vision due to the capsule turning cloudy. To clear the vision, the doctor will use a laser to make a somewhat circular opening in the capsule. 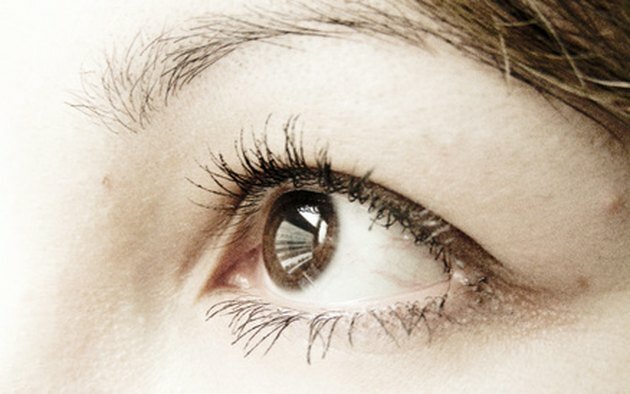 Fragments of the capsule may pass through the patient's vision, but the floaters should clear within a few weeks, according to the All About Vision website. Some people notice occasional floaters, but these should not disrupt vision. Conditions such as diabetic retinopathy require laser treatment on the retina, the light-sensitive layer of tissue that lines the back, inner part of the eye. Diabetic retinopathy results when abnormal blood vessels grow on the retina and leak fluid. To stop the leaking vessels and prevent the growth of new, abnormal vessels, the eye surgeon will use the laser to make small, precise burns on the retina. After the laser treatment, the patient will often experience blurry vision and may notice small spots, reports MayoClinic.com. The spots will not usually move, and they occur as a result of the laser burns on the retina. Over time, the black spots may gradually disappear. The leaking blood vessels from diabetic retinopathy may cause fluid to leak into the vitreous, the jelly-type substance that fills the back chamber of the eye. People who have this type of bleeding will often see dark spots in their vision, resulting from the leakage into the vitreous, states The University of Michigan Kellogg Eye Center. If the retinopathy or leaking vessels did not respond to treatment, this bleeding may occur after a laser treatment, and this could result in new floaters. What Are the Treatments for Corneal Edema Resulting From Cataract Surgery?